The admission for the fall 2017 entering class was highly competitive, with 223 applicants being enrolled from a pool of 2,099. The class represented 109 different colleges, and came from 23 states and countries. In the 2017 entering class, women represented 54% of the class, 29% were minority students and the average age was 25. The median GPA was 3.49 and the median LSAT score was 160. The 25th/75th percentile of entrants had GPAs of 3.24/3.70, and LSAT scores of 156/162. Temple Law School currently employs 68 full-time faculty members and retains numerous local attorneys as adjuncts. The faculty is well balanced and diverse. Gregory N. Mandel, a noted intellectual property law scholar, was named Dean in May 2017. JoAnne A. Epps, a professor at Temple Law since 1985, served as Dean from 2008-2016, when she was appointed Provost of Temple University. Robert J. Reinstein served as Dean of the Law School from 1989 to 2008. Temple Law School offers two study abroad programs that are open to students from any ABA approved law school: the summer session in Rome and the spring semester in Tokyo (at Temple University Japan). The Tokyo program is perhaps the most notable, as it is the only ABA-accredited semester program for law students in Japan. Additionally, Temple JD students are eligible to study at the following partner institutions:Tsinghua University, University College Cork, Tel Aviv University, Utrecht University, Jindal Global Law School, University of Lucerne, InterAmerican University, Bocconi University, and University of Muenster. Study abroad credits from any program can be used toward the J.D. program or the joint JD/LL.M. in Transnational Law. The Law School offers several advanced degree programs, including Master of Laws Degree (LL.M.) in Trial Advocacy, Transnational Law, Asian Law or Taxation. Certificate programs in Estate Planning and Employee Benefits are offered through the Taxation program. International lawyers also have the opportunity to design their own curriculum through Temple's General LL.M. program. 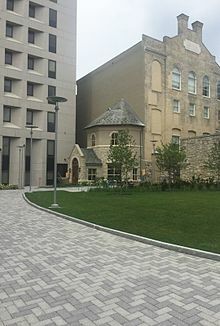 In addition to the LL.M., Temple offers an advanced degree for aspiring scholars, the Doctor of Juridical Science (S.J.D. ), and a Graduate Teaching Fellowship program. The Graduate Tax Program is designed to provide understanding of complex taxation issues. The program provides candidates with a strong foundation in tax law, as well as the opportunity to develop expertise beyond the level of study offered in J.D. programs. A degree candidate must satisfactorily complete 24 credit hours of course work, including all core curriculum requirements and a writing seminar. Candidates may study on a full-time or part-time basis and all coursework must be completed within four years of matriculation. Applicants must have satisfactorily completed a basic income tax course in law school or demonstrated comparable work experience. An applicant who cannot meet this requirement must take the basic course in taxation offered in Temple's J.D. program in the student's first term after admission to the LL.M. program. Temple's LL.M. in Asian law is designed for J.D. holders and students who wish to focus on the law of Asian countries, particularly China, Japan and India, the more powerful economies of the region. Students complete the first of two semesters at the Philadelphia campus, taking foundational courses such as Chinese Law, Japanese Law, and Law in Asia. Students are then required to spend the second semester at one of either Temple University Japan in Tokyo, Jindal Global Law School in the National Capital Region (Delhi) of India, or Tsinghua University Law School in Beijing, China. Students must maintain a G.P.A. of at least 2.50 (out of 4.0) over the course of the 24 credits they must earn to graduate. Temple offers a general studies LL.M. program for foreign-trained lawyers. With the exception of two required research and writing courses, students can design their own curriculum from more than 180 courses offered annually in American and International law. General LL.M. degree candidates must successfully complete 24 credit hours of course work with a cumulative grade point average of 2.0 (out of a possible 4.0). The program can be completed in two semesters beginning in August and continuing through May. In addition to the main campus in Philadelphia, the General LL.M. is offered in Tokyo and Beijing. Students can also earn up to 6 credits at Temple's six-week summer law program in Rome, Italy. Students in this program must complete classes at the main campus. The Doctor of Juridical Science is a research-oriented degree program designed for those seeking to pursue careers as law teachers and scholars of law. Candidates enrolled in the S.J.D. 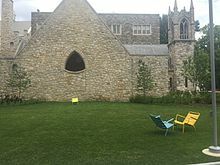 program are required to spend their initial academic year in residence at the main campus in Philadelphia. An Estate Planning Certificate and Employee Benefits Certificate is offered through the Graduate Tax Program for practitioners who do not wish to pursue an LL.M. degree. The Estate Planning Certificate (EPCERT) exposes students to federal estate, gift, and generation-skipping taxation issues, as well as federal income taxation of trusts and estates. Temple Law's Moot Court was started in the 1950s. Moot Court members are selected as second-year law students through the Samuel L. Polsky Selection Competition, which is held during the fall semester. Polsky participants research and write an appellate brief, then argue both sides of the case before experienced attorneys who serve as appellate court justices. Students receiving the highest scores for brief writing and oral argument are invited to join the Society. Temple Law is home to two student-edited journals and law reviews. The Temple Law Review is published quarterly, and the Temple International and Comparative Law Journal is published on a bi-annual basis. According to Temple's official 2017 ABA-required disclosures, 86% of the Class of 2017 obtained full-time, long-term, JD-required employment ten months after graduation, excluding solo practitioners. Temple's Law School Transparency under-employment score is 16.3%, indicating the percentage of the Class of 2016 unemployed, pursuing an additional degree, or working in a non-professional, short-term, or part-time job ten months after graduation. In 2018, Temple Beasley School of Law was ranked the 47th best law school overall and 2nd best for Trial Advocacy training by US News & World Report. Above the Law ranked Temple Law in its annual Top 50 Law Schools report for legal employment outcomes in 2015, 2016 and 2017. National Law Journal ranked Temple Law as the 34th best school in its annual Top 50 Go-To Law Schools report for 2018. The law school ranked 19th for alumni who were promoted to partnership in 2015. Super Lawyer ranks Temple Law as 6th in Highest Caliber Graduate and Most Prepared to Practice. As of July 2017, Temple's Pennsylvania Bar Examination passage rate is 84.57% for first time takers. Alan David Lourie (1970), Circuit Judge for the U.S. Court of Appeals for the Federal Circuit (appointed April 1990). Lynne Abraham (1965), former district attorney of Philadelphia. Mari Carmen Aponte (1975), appointed by President Barack Obama to the position of U.S. Ambassador to El Salvador. Amy Banse (1987), president of Comcast Interactive Media. Edward G. Biester, Jr. (1955), U.S. House of Representatives from Pennsylvania (1967–1977); Attorney General of Pennsylvania (1979–1980); Judge-Bucks County Court of Common Pleas (1980–2006); U.S. Court of Military Commission Review (appointed September 2004). Pat Browne, Pennsylvania Senator for the 16th district. Jim Cawley, 32nd Lieutenant Governor of Pennsylvania. Thomas M. Foglietta (1952), former member of the U.S. House of Representatives for Pennsylvania's 1st congressional district. Mitchell S. Goldberg (1986), judge on the U.S. District Court for the Eastern District of Pennsylvania. Clifford Scott Green, former judge on the U.S. District Court for the Eastern District of Pennsylvania. Martin A. Herman (1963), politician who served in the New Jersey General Assembly, where he represented the 3rd Legislative District from 1974 to 1986, and was later appointed as a judge in New Jersey Superior Court in Gloucester County. Kathleen Kane (1993), first female Attorney General of Pennsylvania; first Democrat elected to Attorney General of Pennsylvania; first incumbent Attorney General of Pennsylvania to be convicted of a felony while in office. Mark Levin (1980), Chief of Staff to Attorney General Edwin Meese and nationally syndicated radio host. Jose L. Linares, Judge, United States District Court for the District of New Jersey. Mary M. Lisi, Judge, United States District Court for the District of Rhode Island. Seamus McCaffrey, Justice on the Supreme Court of Pennsylvania. Pat Meehan, United States House of Representatives, Pennsylvania 7th District; former United States Attorney for the Eastern District of Pennsylvania. Cecil B. Moore, (1951) civil rights activist, and former member of Philadelphia City Council. James M. Munley (1963), judge on the United States District Court for the Middle District of Pennsylvania. Leon Rose, basketball sports agent. Clients have included Lebron James and Allen Iverson. Timothy J. Savage (1971), judge on the United States District Court for the Eastern District of Pennsylvania. John F. Street (1975), former mayor of Philadelphia. Charles Swift (1999 L.L.M. ), a Lieutenant Commander in the U.S. Navy, Judge Advocate General's Corps. Petrese B. Tucker (1976), judge on the United States District Court for the Eastern District of Pennsylvania. David Urban (J.D. ), Political commentator and lobbyist. Franklin S. Van Antwerpen, judge on United States Court of Appeals for the Third Circuit, former judge on the United States District Court for the Eastern District of Pennsylvania. ^ As of October 31, 2016. "Temple endowment exceeds $500 million". Temple Now. November 28, 2016. 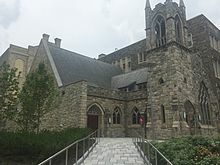 ^ "Temple University (Beasley)". Best Law Schools. U.S. News & World Report. Retrieved 25 January 2019. 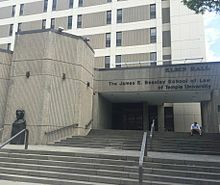 ^ "How Does Temple University James E. Beasley School of Law Rank Among America's Best Law Schools?". grad-schools.usnews.rankingsandreviews.com. Retrieved 2016-07-30. ^ "ABA Required Disclosures - Temple Law". Retrieved 2015-06-07. ^ "Professor Gregory N. Mandel Appointed Dean - Temple Law". 2016-07-15. Retrieved 2016-07-26. ^ "Annual Placement Reports" (PDF). ^ "2018 Top Law Schools". ^ "The 2017 ATL Top 50 Law School Rankings". Retrieved 2016-07-28. ^ "The Top 50 Go-To Law Schools". Retrieved 2016-07-28. ^ "Can you get a job after graduation". Super Lawyer. 6 April 2015. ^ "July 2017 Pennsylvania Bar Examination Statistics" (PDF). 2013-10-18. Retrieved 2016-07-31. ^ "Alan D. Lourie". U.S. Court of Appeals for the Federal Circuit. ^ "Edward G. Biester, Jr". Biographical Directory of the United States Congress. ^ "Pat Browne". Project Vote Smart. Retrieved 26 February 2013. ^ "Jim Cawley". Project Vote Smart. Retrieved 26 February 2013. ^ "Thomas M. Foglietta". Biographical Directory of the United States Congress. Retrieved 28 February 2013. ^ "Mitchell S. Goldberg". Federal Judicial Center. Retrieved 28 February 2013. ^ "Clifford Scott Green". Federal Judicial Center. Retrieved 28 February 2013. ^ "Kathleen Kane". Project Vote Smart. Retrieved 28 February 2013. ^ "Mark Levin". Notable Names Data Base. Retrieved 28 February 2013. ^ "Jose L. Linares | District of New Jersey | United States District Court". www.njd.uscourts.gov. Retrieved 2016-07-29. ^ "Mary M. Lisi". Federal Judicial Center. Retrieved 28 February 2013. ^ "Seamus McCaffrey". Notable Names Data Base. Retrieved 28 February 2013. ^ "Pat Meehan". Biographical Directory of the United States Congress. Retrieved 28 February 2013. ^ "James Martin Munley". Federal Judicial Center. Retrieved 28 February 2013. ^ "Timothy J. Savage". Federal Judicial Center. Retrieved 28 February 2013. ^ "Martin J. Silverstein Ambassadorial Post Uruguay, 2001 – 2005". Council of American Ambassadors. Archived from the original on March 11, 2012. Retrieved January 30, 2013. ^ "John F. Street". Notable Names Data Base. Retrieved 28 February 2013. ^ "Petrese B. Tucker". Federal Judicial Center. Retrieved 28 February 2013. ^ "Meet Pa.'s David Urban, Trump tactician and 'traffic controller' at RNC". The Philadelphia Inquirer. July 20, 2016. ^ "Franklin Van Antwerpen". Federal Judicial Center. Retrieved 28 February 2013. ^ "Jim Walden (LAW '91) - Temple Law School - Advocacy is..." Temple Law School - Advocacy is... Retrieved 2017-12-14.